Yesterday. Yesterday was a week of bad days smushed into a mere 24 hours. By the time I returned home, nothing mattered, other than crawling into my favourite pjs and crabbing a giant gin and tonic (although we were sadly out of gin). If I’d had the energy, I would have grabbed my colouring books and pencils, built a blanket fort and hid from the world until next week. Call it the end of a long, long year, the need for our holiday to begin N O W, a case of being overly tired from lack of sleep or simply a bad day. Regardless, yesterday sucked. Knowing that yesterday wore me out—psychologically and physically—The Cuban aka my hero sent me the perfect email sometime after I drifted off to sleep. (Never mind the weirdness of a couple who work from rooms next to one another sending emails back and forth—we (and by ‘we’ I mean ‘I’) are forgetful at times and email occasionally works best.) This email was silly. It was kind. And, it was honest. And, it was precisely what I needed to put yesterday behind me. As the holiday season descends upon us, it seems as though everyone is overtaxed and overly tense and perhaps more than a little sensitive. Words and facial expressions and simply sighs may be taken out of context and in ways not fully intended. Individuals may be stretched to their absolute limits to such an extent that a smile can ease their minds or bring them to tears. This all rings true for me at the moment. So, let’s all channel Ralph Waldo Emerson with a slight update: Be silly. Above all be kind And, be honest (unless it contradicts the first two). And, for everything else, here is a picture of The Cuban’s grandmother with a rooster. Just because. We are fond of silliness in this home. Very fond. One habit we formed very early in our relationship was the random placement of notes to one another in places we’d least expect to find them. These are not the ‘I’ve gone to the supermarket / work / gym / ice fishing’ type notes. They may or may not have something to do with a household chore, but normally they are just little message that we’ll ‘get’, but others would find puzzling or just plain weird. I love them. I love that he normally illustrates his notes to me. 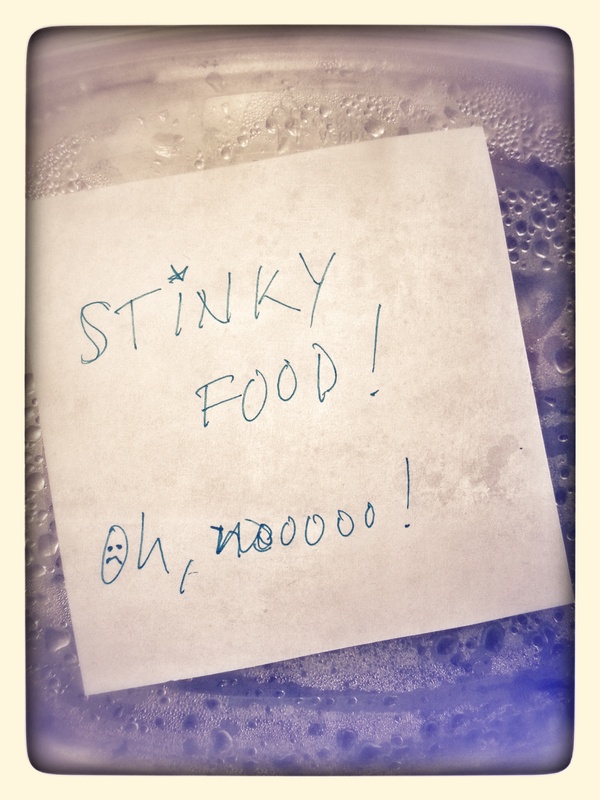 This afternoon, as I was rooting around for some afternoon grub, I found the above note on top of the leftovers from my dinner last night. Not being a huge fan of chicken, my husband wasn’t shy at all about letting his feelings be known about this particular dinner item. Evidently when he put the container in the refrigerator last night, he was inspired to share his thoughts. Through a note. It took me completely by surprise when I found it today. It made me giggle. And, that’s the point. A little random bit of silliness to make us smile and hopefully giggle. Today has not gone at all to plan. At. All. Largely my own doing, I’ve had a tedious, frustrating, would-rather-pull-the-covers-over-my-head sort of day. I’m behind and staring down the barrel of a deadline, I’m not feeling at all my best (sniff, sniff, cough, cough) and, quite frankly, I’d love nothing better than to pound my fists on my keyboard and desk rather than gently punch the keys at the moment. Yeap, not a great day. Then, there’s the image above. My darling husband and cheeky cat have been incredibly patient all day with me. The Cuban quietly left the flat at the best of moments (largely because I was impossible and I suspect it was better out in the arctic blast than inside listening to me and my monumental meltdown of sighs and whines). Upon his return, I finally pulled myself away from the chains of my desk for a few moments to catch these two lovely beasts of mine in this pose. How could my day not immediately improve? It’s still a rather crappy day (again, mea culpa). But, it’s bearable due in large measure to the moments of loveliness and silliness my little furry family provides. Thanks, my darlings! I couldn’t do it without you, and tomorrow will be infinitely better!